The ICAS 35 CAs under 35 winner discusses his firm’s innovative approach to private equity. How will MiFID II impact sell-side and buy-side? Matthew O'Keeffe explains. 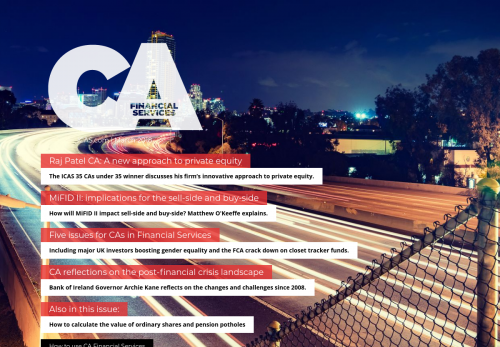 Including major UK investors boosting gender equality and the FCA crack down on closet tracker funds. Bank of Ireland Governor Archie Kane reflects on the changes and challenges since 2008.